He has gone to a land where naught can delight him. While alone he does mourn on the isle of Saint Helena. Oh, Louisa she weeps for her husband’s departing. And the loud billows’ roar on the shore’s rocks are beating. With his eyes o’er the waves that roll round Saint Helena. Or your days they may end, like his, on Saint Helena. Certain people and events seem to attract folk songs like magic. Francis James Child listed 39 Robin Hood ballads (and he missed a few). There are at least fifteen songs about the sinking of the Titanic. James Hogg found dozens of songs about Bonnie Prince Charlie just in English, and there were probably dozens more in Gaelic (though how many really were passed from hand to hand is debatable). 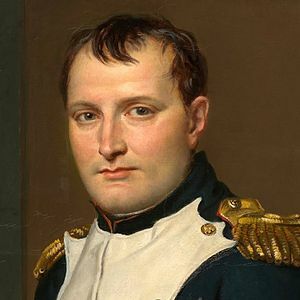 But if I had to name the one man who most influenced folk song, it would surely be Napoleon Bonaparte (“Boney”). 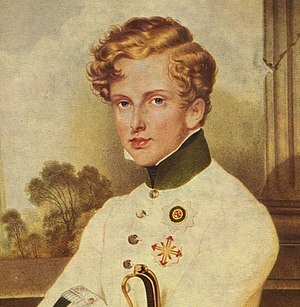 I’ve met nearly fifty Napoleon- related songs in my life, and I’m sure there are others. Verse 1 (and following) — Saint Helena. After his defeat at Waterloo, Napoleon gave himself up to the British. He was exiled to the remote Atlantic island of Saint Helena, where he died. Verse 2 — Louisa. Princess Marie Louisa of Austria, Napoleon’s second wife. She did bear him his only legitimate son (mentioned below). But, contrary to the song, there was no love lost between them; even before his first exile, to Elba, she was said to have taken the general Adam Adelbert Neipperg as her lover. And when Napoleon died, his last mention was said to be of Josephine (Beauharnais), his first wife. Verse 3 — Mount Diana. The highest point on Saint Helena is called Diana’s Peak. Verse 4 — Saint Cloud. No, not the city on the Mississippi! It’s one of the courts of the French kings. Verse 4 — The young King of Rome. One of the titles Napoleon awarded to his son — usually known as “Napoleon II” or “the Duke of Reichstadt.” He died in 1832. Verse 4 — The prince of Gehenna. The devil. Verse 5 — You Holy Alliance. 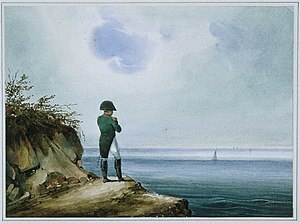 The agreement set up after Napoleon’s fall to assure that there would be no more Bonapartist pretenders. It was, in the long term, a complete failure — Napoleon III, the nephew of Napoleon I, would become Emperor of France a few decades after the death of Napoleon I. Note incidentally the punctuation in the last line. Not because it’s necessarily correct. It is somewhat arbitrary. So is the the pronoun; “he,” “him,” and “his” all show up in the tradition. All of these have slightly different meanings. Maybe there is some sort of an English lesson in there. Source: This song has not been collected in Minnesota, but I include it for historical interest, and because it’s such a brilliant song. This magnificent tune I learned from the singing of Mary Black. She did not indicate a source. The text is somewhat problematic. This song has been collected many times — but the versions are pretty consistently defective. The likely reason is that the original (probably a broadside) was rather flowery, and hence easily corrupted. Unfortunately, until that broadside surfaces, it is also very hard to reconstruct. I once sat down with seven or eight versions of the song, and tried to create a stemmatic reconstruction. It couldn’t be done; the texts were too diverse. This is the version that I gradually evolved by non-critical means. The starting point was the version sung by C. K. “Tink” Tillett. This was collected twice, first by Louis W. Chappell in Folk-Songs of Roanoke and the Albemarle and then by the Warners. These two versions, we might note, were different! — Tillett apparently worked hard to reconstruct what he had learned after Chappell had met him, and gave a fuller version (six verses rather than five) to the Warners, with a few other words changed. So I started from the Warner version (which incidentally has a tune fairly similar to, but not the same as, Black’s), and over the years I’ve accumulated changes which resulted in the version above.